The Shirley Lake Trail is a new hike for the winter of 2017. It is Trail #3 at Elk Island. Here are pictures from a previous Waskahegan hike May 17th, 2015. In Edmonton we will meet at the northwest corner of the Real Canadian Superstore parking lot on Calgary Trail and carpool (leaving at 10 a.m.). 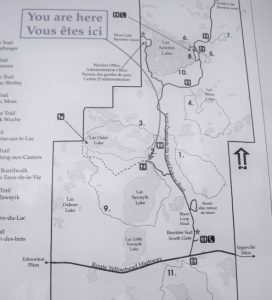 You may proceed to directly to Elk Island on your own, but should check the website prior to departure in case of a change (e.g., weather forecast, trail conditions). The trailhead is the parking lot at the Tawayik Lake lot (on Tawayik Lake Access Road). We’ll begin the hike around 10:45 a.m. If you are new to WTA hikes, then you should visit the Guided Hikes webpage for essential information. For further information specific to this hike, refer to The Waskahegan Trail Guide Book, pages 94-95, or contact the Hike Leader, JoAnne B. & Lee S. , at 780-487-0645.